The non sense foot bridge which was removed a couple of days ago might now find a place on the “Nala” in Shastri Nagar. Sources told the blog, that people from Corporation and also the firm in charge of removing the foot over bridge visited the site yesterday. Belgaum has so many places in the city where this foot over bridge could be boon, but it seems that the Non sense foot over bridge is used to create non sense. Foot over bridge might be put at Shastri NagarThe non sense foot bridge which was removed a couple of days ago might now find a place on the “Nala” in Shastri Nagar. 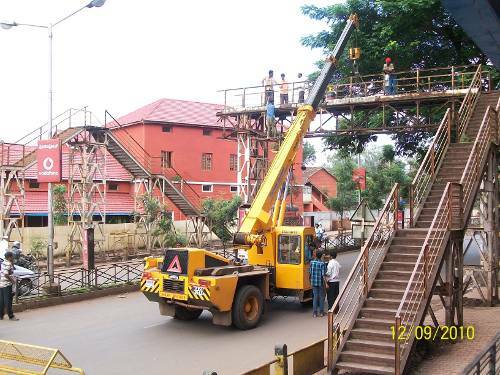 Sources told the blog, that people from Corporation and also the firm in charge of removing the foot over bridge visited the site yesterday.Belgaum has so many places in the city where this foot over bridge could be boon, but it seems that the Non sense foot over bridge is used to create non sense. Plenty of "non sense" things from the City Corporation!